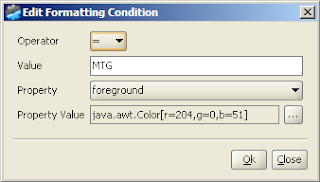 A very useful feature for reports is the possibility to mark somehow a value.It may be outside a desired range or it may be equal / not-equal to a specified value. Think about a medical test report (if some index is less or greater than normal values). 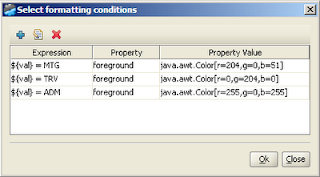 To achieve this in NextReports, a new property called "formatting conditions" is used. 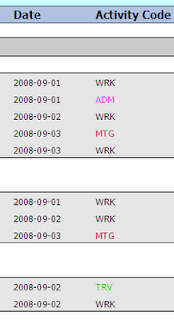 By selecting a column or a function cell in the report layout, you could modify this property. For example, we want to highlight in different colors the activity code inside a project time sheet. For every code we are interested in, we can choose a different foreground. When we add a render condition, we can choose which property we want to modify at "render time" , like foreground, background, font, color. We select an operator, the value we want to compare with and the property value. The property value will overwrite the general cell property defined in the layout if the condition is met.